Click Here to purchase this book on Amazon $29.95 plus shipping If you have Amazon Prime the shipping is free! ​"​Ideas & Patterns for Art Yarns: A Guide to Using Textured Handspun Yarn" is a collection of simple ideas inspired by beautiful handspun textured art yarn. You may spin these yarns yourself or purchase them from fiber artists. People are always asking us how we use the handspun art yarns that we spin. This collection of patterns and recipes will provide over 30 answers for you to explore. Created for all experience levels, these ideas call for simple knit or purl stitches and simple crochet. You will also find a special book bonus including a private page we created for our readers to update you on variations we have come up with using different weights and textures for the same patterns. Enjoy! Shipping within the US is included in the price. We ship on Mondays. FOR ORDERS OUTSIDE THE US: "​Ideas & Patterns for Art Yarns: A Guide to Using Textured Handspun Yarn" is a collection of simple ideas inspired by beautiful handspun textured art yarn. You may spin these yarns yourself or purchase them from fiber artists. 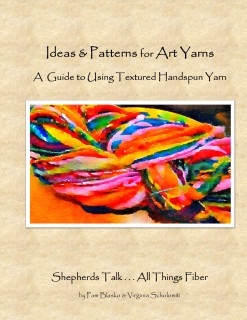 People are always asking us how we use the handspun art yarns that we spin. This collection of patterns and recipes will provide over 30 answers for you to explore. Created for all experience levels, these ideas call for simple knit or purl stitches and simple crochet. You also get a free bonus coupon inside your book, and access to a special page were we constantly post variations.